Only the second album by the band and they hit a major, major home run: to many people, this is their absolute best album, a masterpiece that the band never topped. A double album with well arranged, deep and hard hitting songs in a variety of different styles. A second album of brilliant improvisations. It still serves as their most famous album (though not their best selling; oddly, that is “Phallus Dei”) and has become a cornerstone for krautrock and rock and roll in general. In fact, it could be said that the band can be forgiven the last several crappy albums they made on the strength of this album alone. Do I come across too strongly? Perhaps I do. In fact, I can’t say I fully believe all of this hype when it comes to this record. I don’t think it’s as influential as it has been stated: true, there is a gothic feel to the proceedings that undoubtedly influenced the sonics of various bands in their wake. However, few of these bands handled these atmospheres as effectively as “Amon Duul II” turning in slightly derivative and sometimes laughable works. I’m not sure why this is: the band is certainly as good as “Can” and much better than “Kraftwerk.” I think the problem lies in the fact that the works of “Can” and “Kraftwerk” break more new ground than “Amon Duul II.” As startling as the sound of the band appeared to be, it rarely deviated too far from established patterns of jamming. There was none of the clinical synth work one can associate with “Kraftwerk” and the band’s playing abilities don’t match the impeccable standards set by “Can” and the band’s jam’s rarely become truly exciting in the same way. Case in point: the second record of “Yeti.” These improvisations are more solid than the improvisations of “Phallus Dei” in many way: the sound is deeper, the playing is more fluid and the band tries many different things. However, they usually fail to set a mood in the same way. Often they seem like directionless ramblings in a way that makes me think that “Phallus Dei” was much better planned than I expected. This is odd considering three guys from “Amon Duul” actually guest on the track. Looking at it this way helps turn the second record from a failed and dated (though I hate that word) experiment into a fun diversion. Besides, it’s not as if the rest of the album differs greatly from this loose jamming atmosphere: the band is still in full flight. But a sense of focus drives the band to creating the first studio masterpiece they ever managed. Anyways, the songs moves through various moves including a violin led section with dramatic downward riffs, quieter ominous singing and ending with a repetition of the beginning riff. As you can see, this type of music is hard to describe. The band interacts in various complex and memorable ways. The atmosphere is still more important but it is at least tied to memorable riffs and a structure that makes sense. Themes are repeated at key moments to help keep the song coherent. And it doesn’t ramble all over the place: it carefully works a single mood, a much harder task. A physical embodiment of the album attacking the listener. 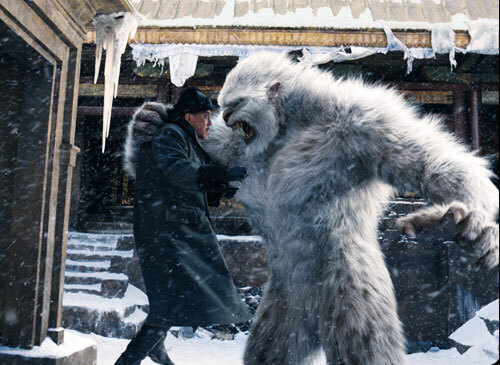 Image from “Yeti: Curse of the Snow Demon” Property of American World Pictures. The same rock sensibility is true of the third track, “Archangel Thunderbird” one of the band’s hardest rockers and a highlight of their stage show. It is essentially a more compact version of “Soap Shop Rock” featuring all of the benefits that implies. Similar to this song is the fifth track “Eye Shaking King” which differentiates itself with a slightly middle eastern sounding riff, wild distorted vocals and a wildly panning guitar solo which moves from left to right rapidly. The second track “She Came Through the Chimney” (potential Beatles associations aside) is a quieter track, filled with gentle guitar melodies, careful violin playing and a less aggressive stance. Kind of the calm after the storm: after the intensity of “Soap Shop Rock” it’s nice to see the band relax and take it easy. Flutes (probably mellotron based) and bongos make heady contributions to this track. An odd, dissonant organ track upsets the simple mood. The organ sounds almost like a violin, quietly making noise in the background. “Cerebeus,” the fourth track, is an acoustic guitar driven piece with a generic “middle eastern” key. Bongos keep the rhythm, giving the piece an ominous feel. Several words kept popping up in this review: ominous and middle eastern. This was not on accident or due (completely) to lazy writing. The band truly sounds scary on some of these tracks, like the kind of music the devil would hear in hell. Taking on all of these “exotic” (to untrained western ears) keys and melodies helps contribute to that feeling. The band also overdubs like mad. There are sometimes what feels like dozens of tracks going on in the rockers while the slower “ballad” type songs have weird details that derail their moods (such as the organ in “She Came Through the Window.” On the one hand, the album often sounds all of a piece. For the longest time (and even now) I have a hard time differentiating the songs besides the opening “Soap Shop Rock” which sticks in my mind due to being heard first. And very few of these melodies will stick in your head forever. They are written well enough that, with the production and arrangements they create a seriously demented and individualistic mood I’ve never heard anywhere else. For that reason alone, the album is worthwhile. However, the music itself (as well as the playing) is good enough to guarantee this album legendary status. The band was to top itself a year later with its next (naturally double) album. But that’s for another day.